For those who missed it, last night’s program focused on several high-cost areas of health care where the evidence suggests that too much medicine is doing us more harm than good: knee pain, back pain, chest pain and PSA (prostate specific antigen) screening for prostate cancer. The program’s key targets were sophisticated and expensive medical tests – such as computed tomography (CT) scans and magnetic resonance imaging (MRIs) – being ordered in ever greater numbers, often unnecessarily. In the past ten years for example, GPs have increased their test ordering by more than 50%. This equates to around four million extra tests a year. While it might seem like common sense to want to take a test to see what’s wrong, the problem is that test results can often be misleading and unhelpful – and can start a cascade of further unnecessary tests and treatments. Take knee pain, for example. In the Four Corners program, Professor Rachelle Buchbinder explained that if you give MRIs to healthy people who have no knee pain, you will still find “abnormalities” in their MRI results. This is partly because of the normal wear and tear associated with ageing. 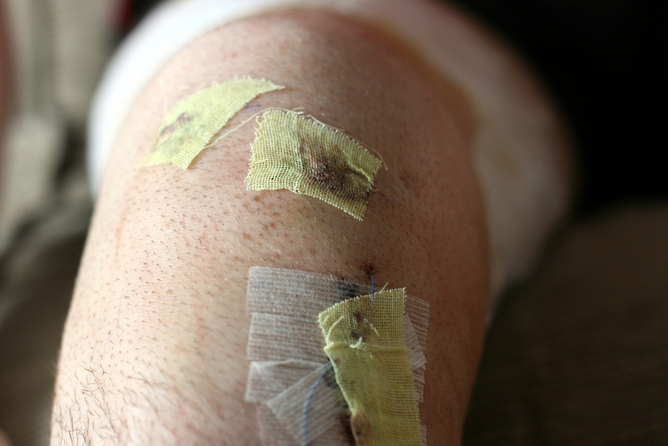 Arthroscopies are needlessly performed for osteoarthritis of the knee. The knee example gets worse. The unnecessary MRI might show some “abnormality” with the knee which has nothing to do with your pain, but is worrying enough to land you with an orthopedic surgeon who recommends and performs an arthroscopy. But as Buchbinder pointed out, there is evidence, from the New England Journal of Medicine no less, suggesting arthroscopy for osteoarthritis of the knee is no better than sham surgery or placebo. More recent evidence, again from the NEJM, suggests arthroscopy to clean up a tear to the meniscus is also no better than sham surgery. One criticism of the Four Corners program is that almost all the interviewees shared the view Australia is doing too many tests and treatments, and urgently needs to wind them back. We didn’t hear anyone take the view we need more medicine not less. To counter that criticism, and in defence of the program, one of the important roles of investigative media is sometimes to take a perspective and run an argument. There’s undeniably mounting evidence of overuse and overdiagnosis, and the scientific credibility of those interviewed was impeccable. Take Dr Robyn Ward, a cancer specialist and chair of Australia’s Medical Services Advisory Committee, which uses an evidence-based approach to assess new tests and procedures. “Often the best medicine is no medicine at all, or the best intervention is no intervention at all,” said Ward, who sees Australia’s fee-for-service system, which largely rewards doctors for throughput, as one of the drivers of excess. Other drivers covered in the program included professional interests, commercial forces, technological change, expanding disease definitions, patient demand and cultural faith in early detection. 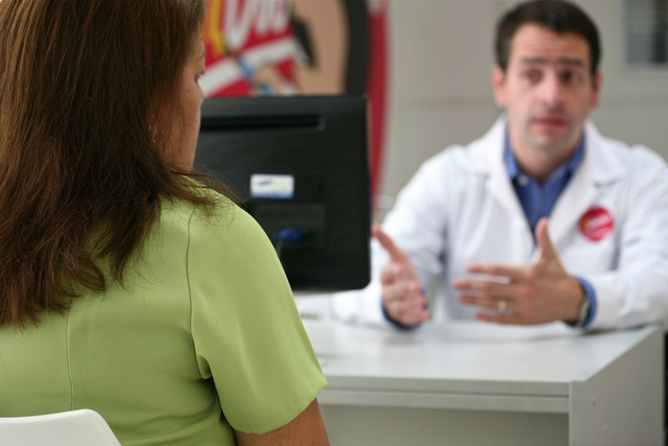 Professional interests and expanding disease definition can drive overdiagnosis. Another interviewee was Associate Professor Adam Elshaug, who has produced internationally respected work on what’s called “low-value care”. His landmark article, published in the Medical Journal of Australia in 2012, listed scores of tests and treatments that are being overused or misused. One of the key claims in the Four Corners program was that almost a third of the money being spent on health care is “squandered”. If you include everything we spend, that’s potentially A$46 billion a year wasted. While this may well be the case in Australia, it’s perhaps worth pointing out that this estimate arises from studies in the United States. A key paper in the Journal of the American Medical Association in 2012 estimated that total health-care waste in the US – including overtreatment, fraud, administrative complexity and other flaws – accounted for between 20% and 50% of the total cost of health care – with the midpoint estimate being 34%. Hence the one-third figure. To my knowledge, there are as yet no similarly rigorous estimates of waste in Australian health care. The federal government is running a major review of all tests and treatments covered by Medicare, with consultation papers released on the weekend. According to those documents, a key objective of the review “is to eliminate the funding of low-value or inappropriate health services — that is, treatments, procedures and tests which are of little or no clinical benefit, through overuse or misuse, and which in some cases might actually cause harm to patients”. Apart from the harms, there is also the tsunami of rapidly rising costs of health care, due in part to ageing, in part to more expensive pills and technology, and in part to overdiagnosis and overtreatment. 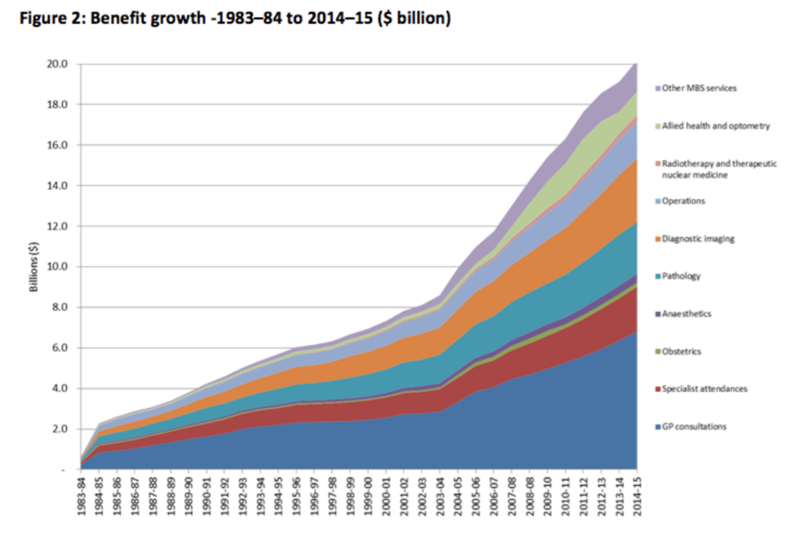 Growth in Medicare benefits; 1983–84 to 2014–15. The national review is expected to report in coming years – though likely only after complex horse-trading over many of the 5,700 items on the Medicare schedule, as doctors debate exactly what is appropriate and what’s not. In the meantime the best approach is a healthy scepticism and as many questions to your doctor as you can squeeze in. Do I really need that test or treatment? Do I really need that diagnosis? Where’s the evidence? And, perhaps most importantly, what happens if I do nothing? Believe it or not, doing nothing is often the best medical care you could get. Who knows, maybe the tide of too much medicine is turning. But can a tsunami can be tamed?